The spacewalkers will install an upgraded electronics box and jettison the old one, pushing it off into space, where it will eventually burn up in Earth's atmosphere, NASA officials wrote in the ISS blog. If there's time left after replacing the electronics box, the crew can work on some optional "get-ahead" tasks. "A pair of exposed experiments, Test and Biorisk, are due to be retrieved and brought back inside the station," NASA officials said. 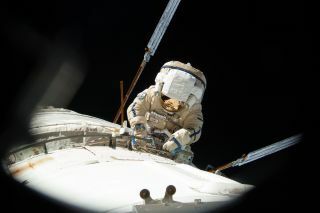 "The cosmonauts may also photograph the back of Zvezda, reposition a foot restraint and jettison old experiment gear." Today's spacewalk will be the fourth of Misurkin's career and the second for Shkaplerov, and it will be the 207th spacewalk at the ISS since construction began in 1998.